Indirectly after travelling via the remote groups of lymph nodes. The jugular trunk, which on the right side drains into the right lymphatic duct and on the left side into the thoracic duct, is created by the efferents via deep cervical nodes. On their respective sides, the right lymphatic duct and thoracic duct generally channel into the junction of the subclavian and internal jugular veins. Total 800 lymph nodes are found in the body, Out of them around 300 lymph nodes are located only in the head and neck region. It is created by lymph node groups, which range from chin anteriorly to the occiput posteriorly and at the craniocervical junction create the pericervical or cervical collar. A small buccal node located beside the facial vein on the lateral side of the buccinator. A small mandibular node located where facial vessels traverse the lower margin of the mandible. A small infraorbital node located just inferior towards the orbit. (b) Superficial cervical nodes are located along the external jugular vein, superficially towards upper portion of sternomastoid. They are the expansions from parotid nodes. (c) Anterior cervical nodes are extensions of submental lymph nodes. They are located alongside the anterior jugular vein. Suprasternal node among this group is often located in the suprasternal space. They surround the trachea and esophagus along the recurrent laryngeal nerves on both sides. They are located posterior towards pharynx and anterior towards prevertebral fascia in the retropharyngeal space. Alongside and nearby the internal jugular vein. Some inside the carotid sheath. Some on the surface of the sheath, under cover of sternocleidomastoid. Deep cervical lymph nodes are divided into superior and inferior deep cervical nodes. It is called jugulodigastric node. Mainly, it drains the lymph from the palatine tonsil and is also known as lymph node of the tonsil. Jugulo-omohyoid lymph node is located superior towards the intermediate tendon of omohyoid posterior towards the internal jugular vein. Mainly, this lymph node channels lymph from the tongue, so it is also known as lymph node of the tongue. This node is located deep towards sternocleidomastoid, and so, it can be palpated only when it is enlarged significantly. Due to the cancers developing in this region has familiar patterns of spreading via the chains of lymph nodes in the neck, which help the surgeons in order to eliminate the preferred lymph nodes; these lymph nodes have high clinical value. The lymph nodes and other lymphoid tissues in the head and neck are often swollen and create inflammations, which are encountered by doctors regularly. In order to perform surgical removal of these nodes, anatomical knowledge of these nodes is vital. 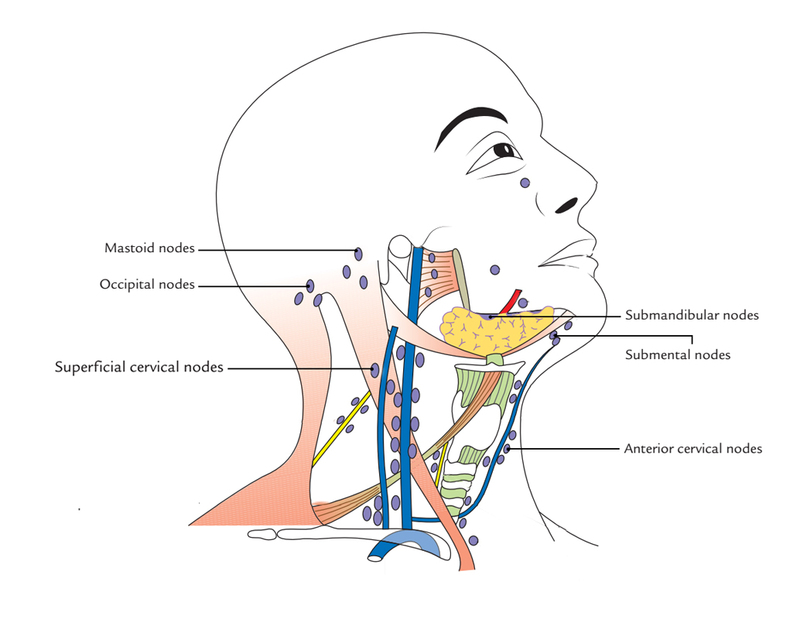 Classification of lymph nodes of neck or cervical lymph nodes based on American Academy of Otolaryngology and the American Joint Committee on Cancer. Inferior towards mylohyoid muscle and superior towards the lower border of the hyoid bone or the carotid division. Anterior towards the posterior boundary of the submandibular glands. Level I (a): submental nodes. Level I (b): submandibular nodes. Internal jugular a.k.a. deep cervical chain. Base of the skull towards the inferior margin of hyoid bone or the carotid division. Anterior towards the posterior rim of sternocleidomastoid muscle. Posterior towards the posterior rim of the submandibular glands. Level II (a): Anterior, lateral, medial, or posterior towards the internal jugular vein. Most superior node is the jugulodigastric node. 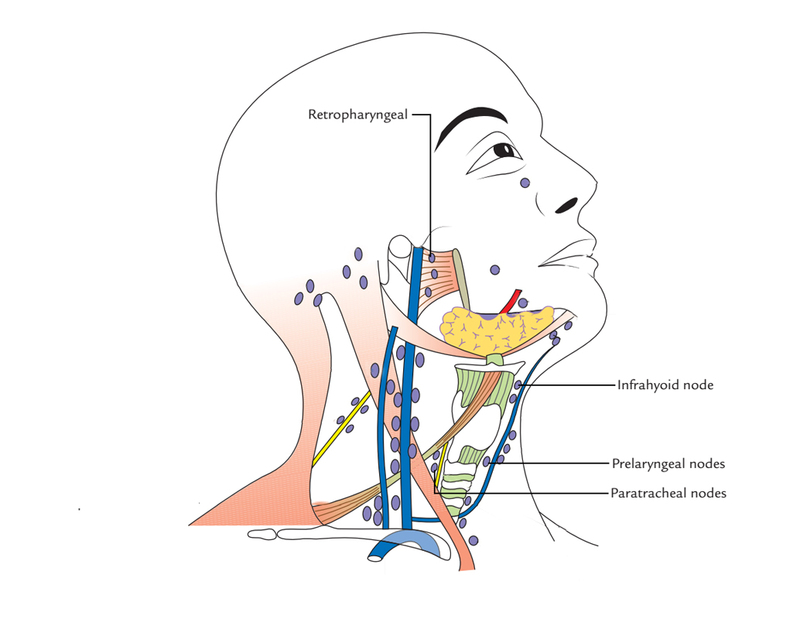 Level II (b): Posterior towards the internal jugular vein and have a fat layer dividing the nodes as well as the vein. Lower margin of hyoid towards lower border of cricoid cartilage or the middle tendon of omohyoid. Anterior towards the posterior border of sternocleidomastoid muscle. Lateral towards the medial margin of the common carotid artery / internal carotid artery. Internal jugular or deep cervical chain. Lower boundary of cricoid cartilage towards level of the clavicle. Anterior and medial towards an oblique line drawn via the posterior edge of sternocleidomastoid and the posterolateral margin of the anterior scalene muscle. Laterally to the medial margin of the common carotid artery. Posterior triangle or spinal accessory nodes. Level V (a): superior half, posterior to levels II and III. Level V (b): inferior half, posterior to level IV. From the inferior margin of hyoid bone till the manubrium. Anterior towards levels III and IV. In the middle of common carotid artery, inferior to superior part of manubrium towards level of the brachiocephalic vein. Some nodes of terminal lymph node group spread out inside the supraclavicular fossa and are associated with brachial plexus and subclavian vessels. These are known as supraclavicular lymph nodes a.k.a. Virchow’s lymph nodes. The left supraclavicular lymph nodes are clinically vital since they are common site of metastasis from malignant disease or cancer of the stomach. The testicular and esophageal cancers may also metastasize in these nodes. In stomach cancer, the Virchow’s lymph nodes are frequently palpable. One or two lymph nodes of this group are located at a higher level in the posterior triangle near the accessory nerve.